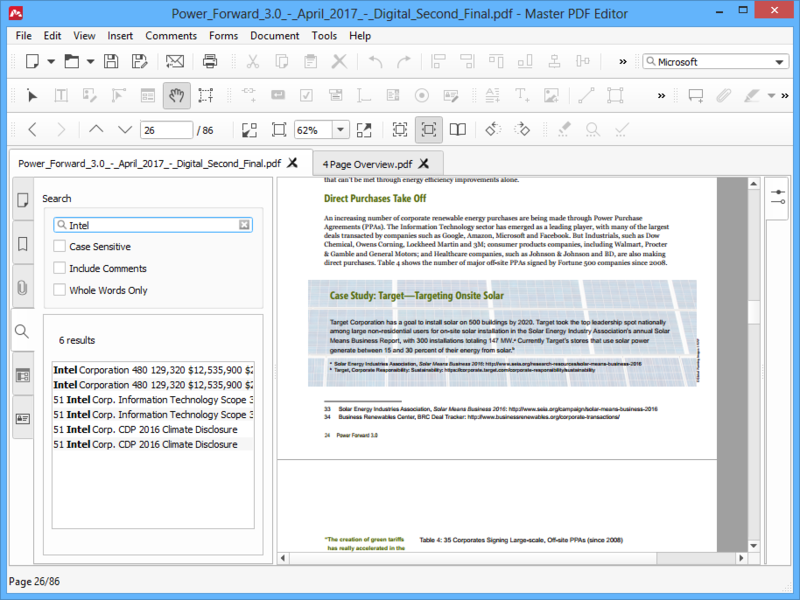 Master PDF Editor offers several ways you can use to navigate opened documents. 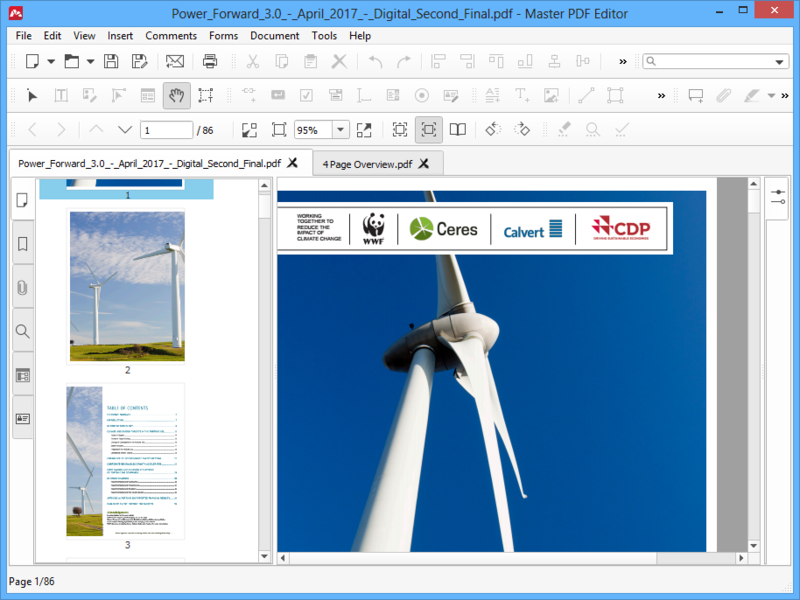 Master PDF Editor can open multiple PDF documents at once, and allows you to switch between them. All opened documents are displayed as tabs above the view area. Click a tab to switch to the corresponding document. This will open the side panel with thumbnails of pages. Scroll the panel to find a page you need, then click its thumbnail to go to it. To navigate across pages of the document, use the View > Go to menu, the View toolbar or keyboard shortcuts. 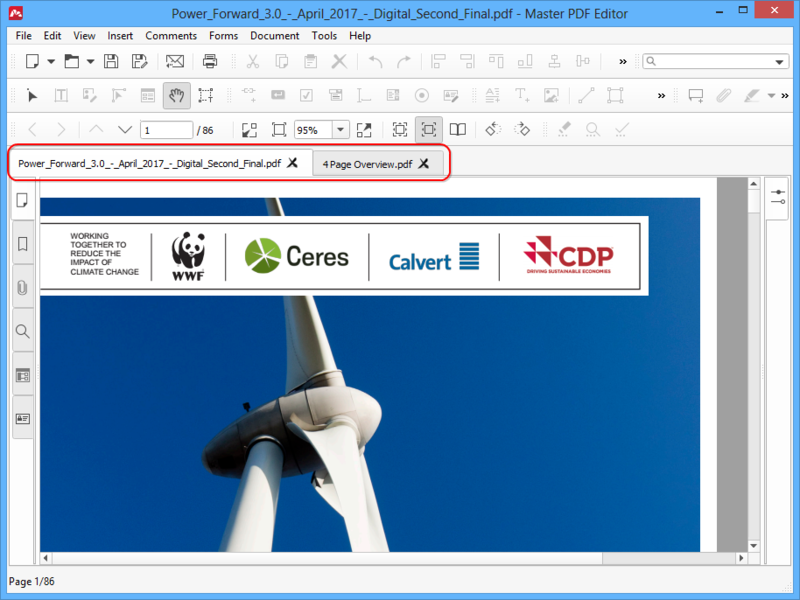 Views in Master PDF Editor are specific states of the view area that you can switch back and forth. A close analogy is Back and Forward buttons in a browser. When you click Back in your browser you return to the previous page you viewed. 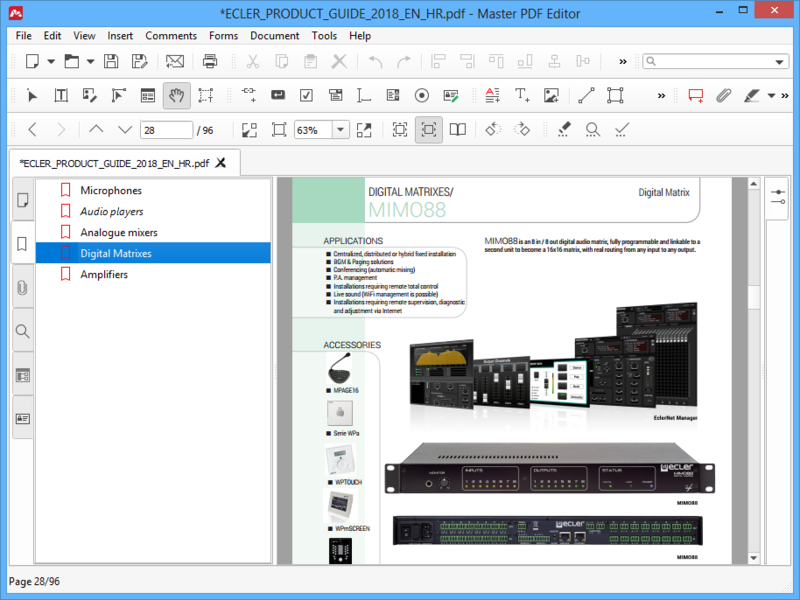 The same way you can return to previous views in the opened PDF document. This tool effectively allows you to quickly navigate across specific pages, search results and various parts of the document without navigating to them directly again and again. To switch to the previous view, use the View > Go to > Previous view menu command or click the Previous View toolbar button . To switch to the next view, use the View > Go to > Next view menu command or click the Next View toolbar button . To make a search using the toolbar box, type any keyword into the search box on the toolbar, then press Enter. To find the next occurrence of the keyword, press F3. Clicking the down arrow of the dropdown box brings up the search settings. Case sensitive – search for the keyword taking into account the exact case of symbols. Whole words only – search for the keyword as a whole word only, not a part of other words. To open the search panel, click the Search tab on the side panel or press Ctrl+F. This will open the side panel. Type the keyword in the search box and press Enter. In the search results list below you will see all fragments of texts containing the specified keyword. 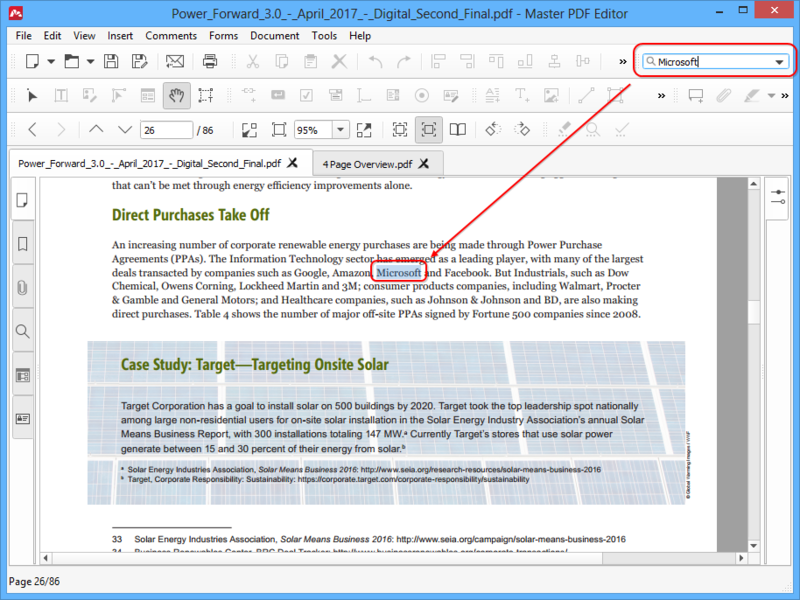 Clicking a result opens the corresponding page of the PDF document and the keyword is highlighted. You can adjust the search preferences below the search box. Bookmarks allow you to ‘jump’ to specific places in the document that you previously marked as bookmarks. To navigate the document using bookmarks, click the Bookmarks tab on the side panel. Then click the bookmark you want to navigate to. 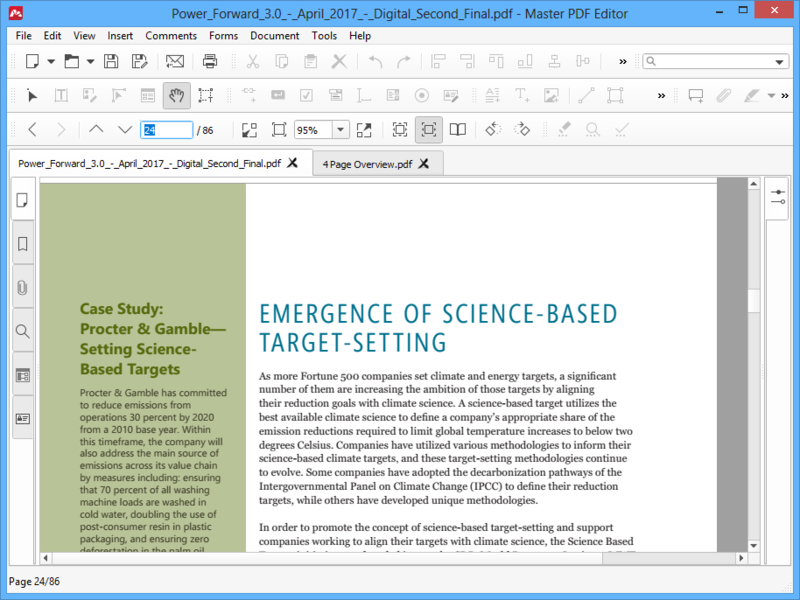 NOTE: navigating to a bookmark not only restores the saved position in the document, but also the scale of the document, i.e. the zoom level. Please refer to the Managing bookmarks section to learn how you can add, delete and modify bookmarks.